The Beast had the blackest hair of anyone I ever knew. And his skin was dark. Mom was whiter than snow. You can see how they were attracted to each other. Oh, and I was the first born. The second-born (out of a total of six) was my sister. We never gave any thought to our colouring – hair or skin – until later on in life, when the fact of our native heritage came up. We are Mohawks. Indians. People of the First Nations. We grew up, however, in a pure Caucasian society: school, Catholic Church, white picket fence neighbourhood. We never suffered any of the stereotypical put-downs that other native kids put up with – the idea that all natives are drunks, for example, or that we give gifts only to take them back immediately (Indian-givers). Mostly because the majority of the kids didn’t look native. I sure as hell don’t (check my profile pic). And my youngest sister has blonde hair and blue-green eyes. So there you go. Still, we are all true Mohawks, and we have our government-issued status cards as proof. Some of that heritage has shown up in different ways. One of my sisters makes dream-catchers, which she sells. Another has delved deeply into Mohawk culture (as has a cousin of mine); she joined a Mohawk association and even attempted to learn the language. I think it has shown up in my life with respect to The Wolf. I don’t talk about it very much (and hardly ever in real life) yet some people have picked up on it. 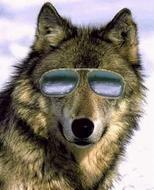 If you were to come into my home, you’d see a number of wolf pictures on the walls and a wolf calendar in the kitchen. I wrote a blog here, called “Wolf” which better explains it. Skin colour generally hasn’t been very high on my radar when it comes to friends or dating. Don’t know why, really – it’s not like I’m an advocate of political correctness or anything. Teenage lust knows no barriers – or at least that’s my thinking. I dated dark-skinned girls as well as light. As long as we both agreed that I rocked, there wasn’t much more to consider. A few years ago, when I was going full-steam as an actor (largely underpaid, if at all), I was part of a group of Canadian actors on a forum. We met in person a few times a year for dinner and drinks. At one such gathering, I found myself surrounded with gorgeous women, some of whom – to my *thank God* appreciation – were single. One of them – a very short, dark-haired little Persian girl – noticed me, but evidently (she complained later) I didn’t notice her. I explained that it wasn’t that I didn’t notice her – I did. It was that she was way too pretty, and probably out of my league. So I saw her, and dismissed her. Like that. After dinner was done, and a bunch of us decided to go bar-hopping, she hung around and came with us. Eventually we got to talking, and flirting. Eventually there were just three of us: her, another woman (who I could tell wanted to pursue something with me) and me. The dynamic was awkward. I wanted to be with the cute little thing, and wasn’t attracted at all to the other girl (oh dear Lord – listen to this – two women interested in me, and I’m complaining that it’s awkward. And that my uncle left me way too much money). So there we were – all three of us – out on the dance floor, dancing together. At one point, the other girl – let’s call her Blondie – left to get more drinks, while the cute little thing – let’s call her Cutie – and I continued to dance. Our eyes caught, and she smiled. I could feel myself smiling too, and we started to dance toward each other. I couldn’t believe it, frankly. When we were close enough, she reached up (waaaay up), placed her hands around my neck while I placed mine around her body and we pulled each other in close for the most passionate kiss I have ever had. God it was hot. We just stood there, giving each other the most x-rated kiss ever, while the rest of the room danced around us. We kept checking for Blondie, and when she got back to us, we broke away quickly. Of course, now that we knew the score – Cutie and I – things got even more awkward. I can’t recall how we managed to dissolve the triangle but we did. She laughed and punched me in the arm. All that time – when we walked together, or made other people in the street or on the bus uncomfortable with our non-stop amorous and oh-so-public displays of affection, our skin colour was just never an issue. It never came up. Except once. We were holding hands, and just sitting quietly together. Both of us were looking at our joined hands – hers was so very dark, and mine was snow-white. And we both laughed, right at the same time. There really was nothing else to say. I always enjoy ready your blogs. I learn more about you in each post. Usually, I save them to read on my cell phone at the dog park, so I don’t leave comments. But I appreciate an articulate man with insights who can spell! Thanks Eileen! Amazing how far technology has come, isn’t it? I do a lot of reading on the iPhone – which is really way too small of a device, really. I’m so looking forward to the iPad’s final release here in Canada. Just so that I can do things like read blogs and other websites without straining my eyes so much. I just have to say as well: I used to be on Myspace (I saw in one of the comments on your blogs that you’re there too), and this place – WordPress – far outshines it when it comes to blogging tools. I have one blog in the draft bin, because I’m not comfortable with publishing it yet. Over on Myspace – the minute you write anything, whether you intend it for your eyes only, or you haven’t finished it, the whole world can see that you’ve written something. That just invites all kinds of questions. Certainly that’s not the case here. Anyway, I appreciate the fact that you’re reading my blogs, and that you commented today. Thank you! Never kissed a boy before like that. Great. Who wrote this for you, Woody Allen? Was the Persian girl a Sufi by any chance? Doesn’t matter, except I’m into the dervish whirling thing. over the phone about our mutual girl and boyfriends. Had some really hot thoughts about her, but being 15 and all, and growing up in the 60s never gave us a chance to go out together. Still remember her “big hair.” Afro. Never forget those eyes and smile with such white teeth against such a dark complexion. And her voice. Like Diane Ross singing solo to an audience of one — me. Native American. Cool. Been to my first Pow Wow. Hope to check out a sweat lodge despite the bad press with people who evidently did not know what they were doing. I don’t know if she was Sufi. That was one of those things we just never got around to talking about – though we discussed a great many things. She said she was Persian and I left it at that. Too bad you never got to go out with that girl from school. You probably would have rocked each other’s world. Cutie eventually moved out west, whereas I stayed here in Toronto. I kind of miss her actually. Nice one! You write in an interesting way. So, a little more gets peeled back every day. :) You be proud to be a Mohawk, a very great Nation! In the summer I can be mistaken for a brown guy…maybe it’s all the Portugese blood…or perhaps my Jamaican heritage? Even though I grew up in a town that had no people of any color, I’ve never given color or race much thought. However, I learned the hard way that sometimes differences in culture can cause problems within a relationship. Sometimes. I think it comes down the system we use for solving problems…it’s difficult to explain. Forgive me. I can guess at what you might be taking about, drawn from previous relationships – though my experience with attacking problems has mostly been from within the same culture. Some people like to argue things out, while others (like me) want calm discussion. And some people just want to vent, without the other guy trying to solve anything. Takes a while to figure out. I don’t this is what you mean though, is it?